I have been on the look out for some great looking Age of Sigmar models on Cool Mini or Not or Putty and Paint, but besides a few fairly good units here or there I hadn't found anything that really stood out with a wow factor. Then I came across this model. 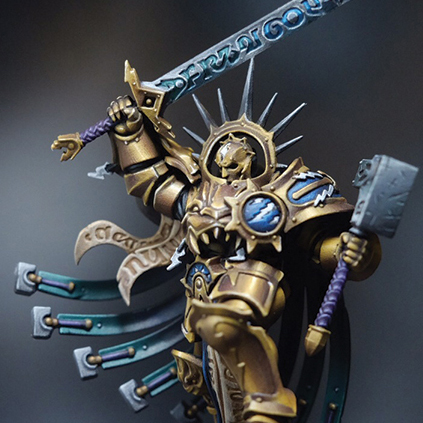 While I do like all of the new sculpts that have come out recently, the Lord-Celestant on foot has been one of my least favorite. This is mostly just due to what I think is an odd looking chest/halo thing going on, but this paint job has changed my mind on it. There isn't any conversion on this mini except for the base, but it's very effective. All he did was elevate the model up on a higher rock, but it really emphasizes his "To me!" pose that he has going on with his raised sword. The Non-Metallic Metals on the Celestant are really nice and not over the top like I have seen some times. The use of the turquoise is also really nice and complements the rest of the colors well. The whole thing has a very cool (as in cold) feel to it. It's nice when a mini maintains a consistent color theme across the whole thing. 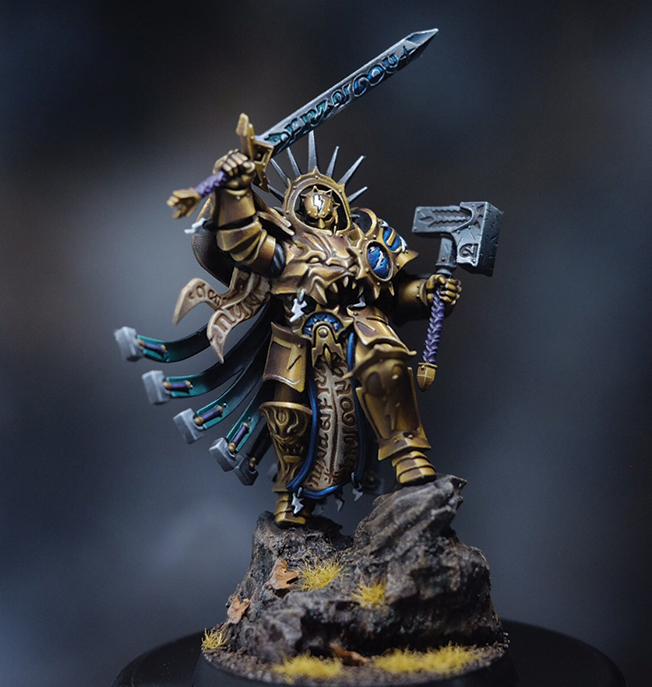 Everything is very crisp and clean and it would be amazing to see more Stormcast Eternals from this hobbyist.